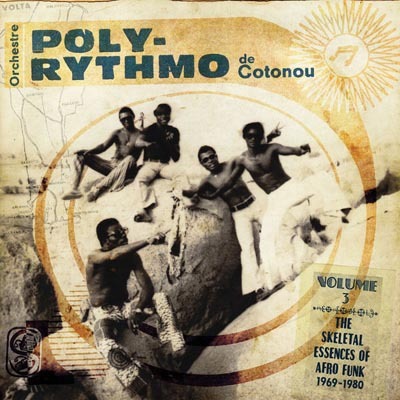 This is the third in a series of compilations from Analog Africa (based in Frankfurt, Germany) that draw their material from the extensive catalog of the legendary band from Benin, the ‘Tout-Puissant’ Orchestre Poly-Rythmo De Cotonou. Led by vocalist and guitarist Melome Clement and anchored by the drums of Leopold Yehouessi and bass of Gustave Bentho, Orchestre Poly-Rythmo created an original sound that brought rhythms such as sato and sakpato from the local Vodoun religion together with many local styles of African popular dance music and international influences including Cuban son, James Brown's tight funk, and the fuzzy electric sounds of 1960's psychedelic rock. The band went through many styles and personnel changes over the years, including a two-decade hiatus. Due to a growing international interest the band stemming from their reissue of their original material on various compilations, the group has re-formed with new and surviving members (Clement passed away in December 17, 2012) and toured the world to promote their latest studio album, Cotonou Club. Although the tracks on Volume Three: The Skeletal Essentials of Afro Funk were all previously released on small labels in West Africa between the years of 1969-1980, they still sound fresh to our ears! From the funky, heavily syncopated guitar of the opening track, ‘Ne Rien Voir, Dire, Entendre,’ to the amazing swing of the drums on ‘N´Goua,’ to the Cuban-influenced ‘Vi E Lo,’ this is another rewarding experience of the breadth and depth of Orchestre Poly-Rythmo during their golden years. One small highlight of this compilation: the moment in the middle of the soukous-like ‘Adjro Mi,’ when all the instruments drop out except the guitar and drums. The resulting duet is perhaps the tightest, funkiest thing ever heard outside of Cotonou…at least until the next installment from the Analog Africa archives of Orchestre Poly-Rythmo.